TTCriders, an organization of transit users, and the Scarborough Campus Students’ Union (SCSU) hosted a mayoral debate focused on transit on September 26. 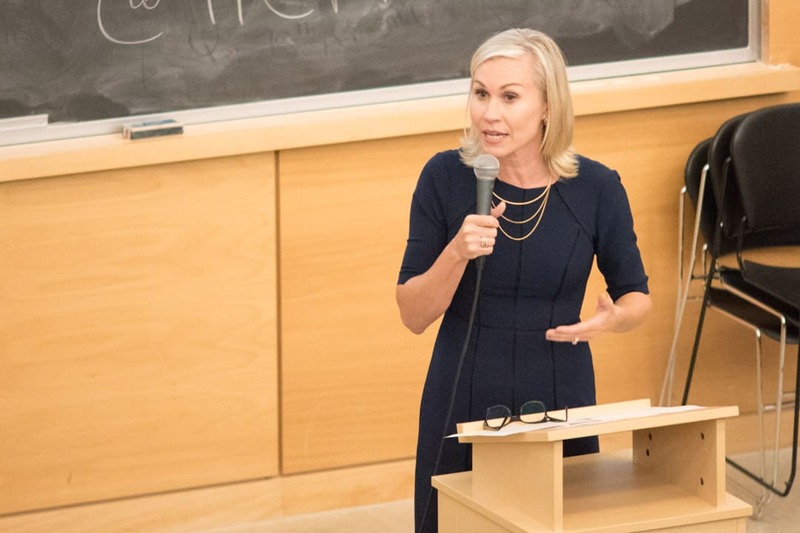 Three candidates — former Toronto chief planner Jennifer Keesmaat, lawyer and activist Saron Gebresellassi, and safe streets activist Sarah Climenhaga — took the stage at the Scarborough campus. The debate was moderated by The Globe and Mail columnist Marcus Gee. John Tory, the incumbent mayoral candidate, was invited but did not attend. At the end of the debate, candidate Dionee Renée, who spells her name D!ONEE Renée, ­was invited to give a two-minute speech. She claimed ownership of the idea of free transit and underscored accessibility needs, which she felt had been lacking during the debate. A Mainstreet Research poll released on September 26 put Keesmaat at 20.3 per cent, nearly 30 points behind Tory, who remains in the lead. Gebresellassi and Climenhaga both polled at around one per cent and undecided voters made up 27.4 per cent of the survey. The same poll found transit to be the most pressing issue in the mayoral election — overtaking concerns of housing affordability, crime and safety, and accountability. All three candidates were asked about their stance on the provincial governments’ moves to take over Toronto’s subway system. The proposal, made by the Progressive Conservatives during the provincial election, aims for the province to adopt major capital maintenance fees and control any expansion planning. Tory showed slight interest in the plan, however City Council voted 30–6 in favor of maintaining public ownership of the TTC. Premier Doug Ford, who campaigned on uploading the TTC to the province and whose party guaranteed the upload under a majority, became the centre of the candidates’ discussion. Keesmaat proposed that any projects to upload the TTC should go through the mayor and the city council. She also emphasized the need for the TTC to remain a “public asset,” refuting any claims that turning the TTC private would raise capital funds or improve the transit system. Agreeing with Keesmaat, Climenhaga commented on Ford’s ability to “do things even if we don’t agree with them” and supported the need to work with the premier on this issue. Gebresellassi criticized Tory for his lack of strong leadership and underscored the need for mayoral leadership that would “stand up against Doug Ford,” particularly on the issue of uploading the subway to the provincial government. The first candidate to mention free transit was Gebresellassi, whose campaign is largely based on the idea of making Toronto the first metropolis in Canada to maintain a free public transit system. Placing heavy emphasis on the idea of “transit as a fundamental human right,” Gebresellassi proposed eliminating corporate loopholes and using federal funding to finance her proposal. Climenhaga took a moderate stance on the issue ­— labeling it a goal to be achieved through long-term investment in the transit system and a gradual reduction of fares. Keesmaat heavily opposed the idea of free transit, criticizing not only Gebresellassi’s funding plans for the proposal, but also pointing out the resulting issues of overcrowding and the loss of the TTC’s operating revenue. She further underscored the need for more investment to develop transit expansion over the development of free transit. During an interview with The Varsity, Gebresellassi pushed back. “I think her position says it all. This is why we keep saying Jennifer Keesmaat is not a champion for working-class people,” a sentiment that was not brought up during the debate. After the failure of the U-Pass referendum last year, postsecondary student fares for transit and the development of a student pass has been the focus of the debate on transit affordability for university students. SCSU President Nicole Brayiannis opened the question portion of the debate by asking about affordable transit for students, especially those who commute long distances. Keesmaat responded to the question by calling out the provincial government for stalling fare integration with GO, which would allow transferring from the TTC to GO without having to pay multiple fares. Inter-municipal fare integration as well as transferable regional fares were proposed for commuting students. Taking a similar stance, Climenhaga agreed on the need for fare integration but also emphasized the need to work with the province on affordable student housing, zoning to make student housing development easier, and increased employment opportunities. In her response, Gebresellassi proposed expanding the low-income transit pass, also known as the Fair Fare Pass, universally. Differing from the other candidates, she also highlighted the need for job opportunities and engagement outside of the downtown core and called for a multitude of plans that would encourage local hiring and youth training. 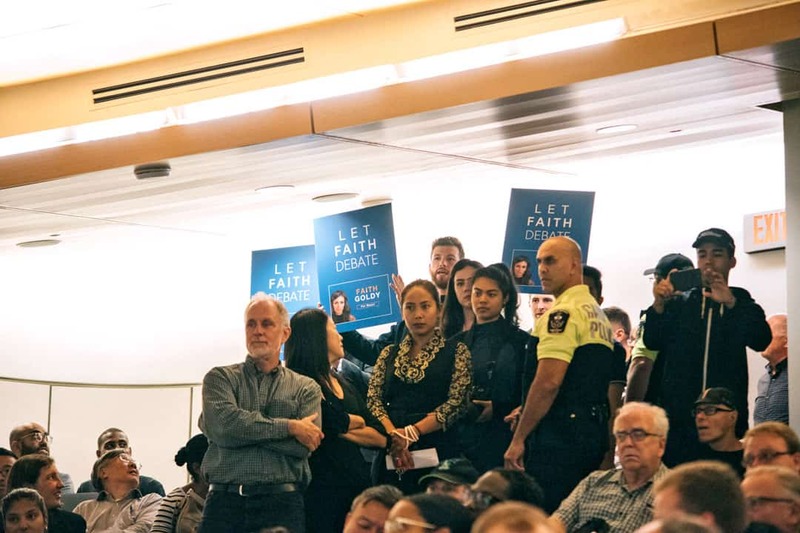 In the middle of Climenhaga’s opening statement, protesters in the audience began shouting, “Where is Faith Goldy?” Picketers with signs that read, “Let Faith Speak,” stood in the back of the room. Faith Goldy, a controversial mayoral candidate associated with white nationalists, was not invited to speak at the event. The commotion prompted multiple audience members to stand up, resulting in loud protests both against and in support of Goldy. The protesters were eventually asked to leave and were escorted out of the room. Goldy herself interrupted a debate just two days earlier, where she was escorted off stage by police officers. The Toronto municipal elections will be held on October 22, and advance voting will take place from October 10–14.